People lift weights and perform other weight training exercises at the Clinical Research Center, the research location for the Wake Forest Health and Exercise Science department. The findings, “Effect of Exercise Type During Intentional Weight Loss on Body Composition in Older Adults with Obesity,” appear in the November issue of the journal Obesity. Losing weight is generally recommended for those with obesity, but preserving muscle – while losing fat – is particularly important for older adults in order to maximize functional benefit, Beavers said. 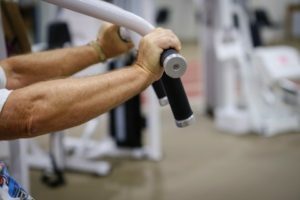 These results may be even more important for older adults who gain and lose weight with frequency, because seniors typically don’t regain muscle – they regain fat mass – which is “all the more reason for older adults to try and preserve muscle mass during weight loss,” Beavers said. November 26, 2017 Copyright © 2012 Eastern Group Publications, Inc.